This award-winning cookbook by Elisabeth Lambert Ortiz includes 500 recipes from the exotic culinary traditions of the Latin American World, covering the coasts, mountainous areas, and fertile plains between Mexico and Chile. Ortiz selects appetizers, soups, main courses, salads, and desserts from each region and explores the wild array of spices and styles that make these recipes unique. Using delicious examples, she describes how the Spanish, Portuguese, African, and Middle Eastern influences have combined with the indiginous cooking of the Maya, Aztec, and Inca civilizations. Her recipes range from familiar favorites such as Guacamole and Feijao Preto (black beans), to more unusual recipes: Sopa de Topinambur (Jerusalem Artichoke Soup -- Chile), Matambre (Stuffed Rolled Flank Steak -- Argentina), Pichones con Salsa de Camarones (Squab in Shrimp Sauce -- Peru), Salada de Palmito (Hearts of Palm Salad -- Brazil), Quimbolitos (Steamed Puddings -- Equador), as well as a wide variety of sauces and breads. 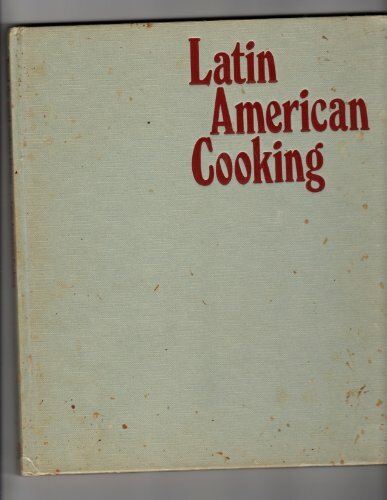 This book is the prototype for all books on Latin American cooking and remains the definitive text on the subject. Great Book.Recipes are easy to follow. Very complete.I have a Colombian background and the most popular Colombian meals are in this book.I also enjoyed the history as well as the separate sections for sauces. This book is a really good voyage into the art of Latin American cooking. The text talking about traditions and the culture in general is very informative and interesting. I bought this product because I read that the book had pictures - I prefer cookbooks that show photos of the recipes - and this book has zero photos of the recipes. I was a little disappointed. Just wanted to make sure that no one else bought the book without knowing this fact. I have tired a few recipes and they are very good, it's just the lack of pictures that bothered me. Happy cooking! Since my father was Colombian and my mother born in America, I enjoyed delicious Colombian cuisine when we visited his family--arepas, sancocho, empanadas, etc--but never learned how to cook this type of food at home. Luckily for me, Elisabeth Ortiz has compiled this wonderful book! She begins the book with a comprehensive list of common ingredients of South American cuisine, including a description of the ingredient and where one might find it. She then continues the book with the usual categories of Meats, Vegetables, Sauces, etc. She includes background and information about the food for each of her recipes. For example, she might describe when and where the meal might be served, or some helpful tips about a particular ingredient. I have made several recipes from this book, and they've all turned out beautifully. The instructions are detailed and easy to follow, even for someone who, like me, has little experience in the particular cuisine. More importantly, though, everything is delicious! I especially like to use the recipes in this book for special occasions. For example, my favorite dish, Pabellon Caraqueno (Steak with rice, black beans, a plantains--the national dish of Venezuela), while simple, takes several hours to prepare. However, I guarantee that, after you've arranged this meal on a platter and set it down in front of your guests, you will be rewarded with some 'Ooohs' and 'Aahhs' and many satisfied taste buds. This meticulously researched volume offers a mouthwatering and practical introduction to the region's cookery. It is packed with authentic and trustworthy recipes as well as a generous amount of essential information and would be an excellent addition to any cookbook collection. Also recommended: "The Complete Book of Mexican Cooking," by the same author. 2. Latin American Cooking Across the U.S.A. 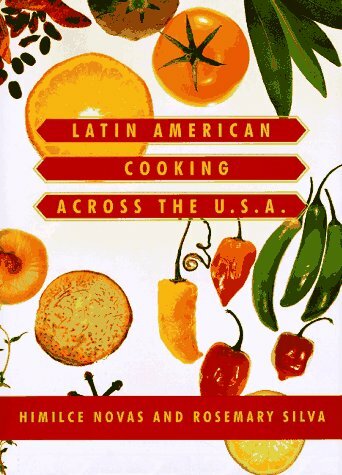 In the first cookbook to encompass the full spectrum of Latin American cooking all across America today, Himilce Novas and Rosemary Silva offer 200 enticing recipes that have been drawn from the home kitchens of Americans with roots in Mexico, Puerto Rico, Cuba, Jamaica, Brazil, Argentina, Chile, Peru, Ecuador, Colombia, Guatemala, and nearly every other corner of Latin America. Spicy, colorful, and full of surprises, Latin flavors are the latest rage with Nuevo Latino chefs from New York to Los Angeles. But here the exotic is translated into wonderful everyday dishes that home cooks can easily master. For starters, Novas and Silva give us luscious Chilled Roasted Sweet Red Pepper and Coconut Soup or Orange-Scented Roasted Pumpkin Soup and appetizers known as antojitos ("little whims")--Bayamo's Fried Wontons with Chorizo and Chiles or a Costa Rican Black Bean and Bacon Dip. For main courses, there are hearty delights like Piri Thomas's Chicken Asopao or a Heavenly Potato Pie with Minced Beef, Raisins, and Olives. Center stage in many a meal are the rice and bean dishes with countless delicious variations on the theme, like Gallo pinto, Red Kidney Beans and Rice, and "Jamaican coat of arms",also called Rice and Peas (which are actually small red beans). And to satisfy the Latin appetite any time of day, also included here is a rich array of tamales, empanadas, and other turnovers, like Little Brazil Shrimp Turnovers stuffed with shrimp and hearts of palm. From Cristina, the Cuban American talk show hostess in Miami, to U.S. Representative Henry B. González of Texas, from film producers and opera singers to young students and grandmothers, the authors have gathered, along with the family recipes and their origins, stories of the past and of the good times celebrated in America. Novas and Silva also offer invaluable information on Latin American chiles, on the earthy appeal of plantains and tubers like yuca and taro, and on other special foods that give these dishes their unique character, along with mail-order sources for hard-to-get ingredients. I tried some of the recipes like Fried Adobo Chicken, Oxtail Stew and few others and they all came out as expected. I just wish it came with some pictures because even though I'm some what familiar with Mexican, Panamanian, and Puerto Rican cooking, I like to see pictures whenever I'm cooking something I didn't grow up on. 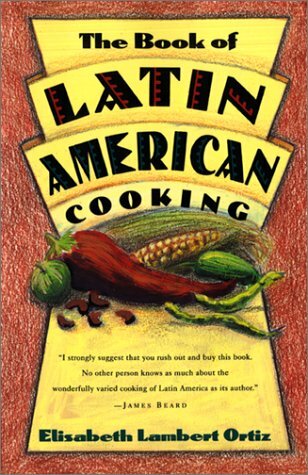 An inspired collection of recipies for those of us who love Latin American cuisine. Himilice Novas & Rosemary Silva have managed to create a unique and totally engaging recipe book. They have combined the art of cooking with the art of story telling and delivered a passionate & spirited collection of Latin American dishes. My favorite dish is the Pargo Dorado con salasa de coco y lima, delicate red snapper in a coconut lime sauce. Another outstandig dish is Abuelita's Vanilla Flan it's smooth & not to sweet. Among a sea of ordinary recipe books, this one sails above the rest and indeed has become my favorite. I wasn't sure at first if I was going to enjoy this cookbook because I am not at all familiar with Latin dishes or ingredients. The recipes in "Latin American Cooking Across the USA" are very accessible, as I've read many of them I've thought to myself "that sounds really good", even ones with ingredient combinations and preparations completely unfamiliar. I am happy that this book dispels the notion that all Latin food is super-spicy, there are subtle and flavorful recipes in this book not just heat ( I think Americans have gone way overboard with hot spices and garlic as if that is a guarantee of good flavor, which it is not). It is also interesting to see how recipes have changed because of availability of ingredients in the US or because of change in tastes by later generations. I can't wait to try so many of these recipes! This is a great cookbook. If you have any interest in cookbooks that are worth reading, as well as using to cook from, just buy it already. You will learn a lot about Latin American family traditions, too. More than 10 years ago, while browsing cookbooks at the Strand bookstore in New York, I came across this book, and discovered Puerto Rican holiday recipes. "Why not try them this year? ", I thought. So, I made Puerto Rican christmas that year, and ever since. A testament to how good/authentic these recipes are is that in that first year, the guests included my (Puerto Rican) mother-in-law and a family friend in from La Isla. The results we warmly greeted. "Eddie's Puerto Rican Roast Pork" is one of those recipes that is super easy, but will result in an indescribably good dish, and a beautiful centerpiece to your dinner. I have made many of the other dishes, too -- all to great acclaim. Favorites inclue the "Arroz con Gandules", "Panama Canal Seviche", "Shrimp Seviche", both Flan recipes, and, of course, "Coquito", the yummy Puerto Rican version of eggnog, with rum and coconut. The stories are as good as the recipes, so even if you don't cook, the book is a terrific read. But, be warned, it _will_ make you hungry. Valeria Sisti grew up in Brazil. She trained professionally atLeith's School of Food and Wine in London, where she now teaches. 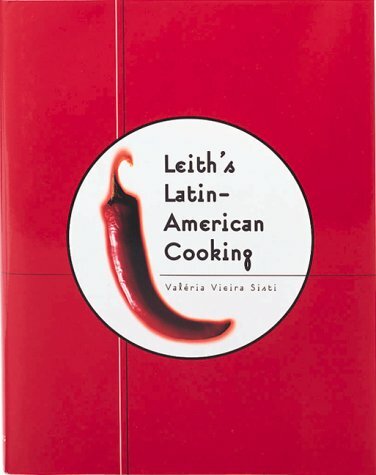 InLeith's Latin-American Cooking, she explains how all theinfluences that make Latin America perhaps the ultimate culinarymelting pot came together. As Sisti shows, appreciating the flavorsand variety of Latin American cooking requires understanding whathappened as waves of invaders overtook the existing cultures and asimmigrants arrived. This influx of new influences began with theSpanish Conquistadors and the Portuguese in the 15th century andcontinued with the Italians, Germans, and Asians who came as laborersin the 19th century. Sisti tells how ingredients and dishes broughtduring the conquests, along with those that came with the Africansimported as slaves, were assimilated and adapted. Many of the importedingredients are indeed the ones most likely associated with LatinAmerican cookery, including wheat, beef, pork, chicken, sugar, rice,citrus fruits, bananas, and coconuts. This book is a mixed bag of recipes. The great Feijoada, theBrazilian mixed stew of meats and black beans, and Picadillo, akind of hash made in various Latin American countries, are theoriginal classics. Most dishes, though, are adaptations or just uselocal ingredients. Hence you find a Chorizo Sausage Quesadilla withParmesan Cheese, Salmon Tacos, and a Tex-Mex chili containing potatoesas well as meat and beans. The glossary is a comprehensive collectionof important definitions. Handsome color photos of food and peopleenrich this book. 10. La Comida del Barrio: Latin-American Cooking in the U.S.A. In this groundbreaking cookbook, chef Aarón Sanchez explores the delicious food and exciting culture of the barrios—the vibrant Latin-American neighborhoods from Miami’s Little Havana and New York’s Spanish Harlem to San Francisco’s Mission, and the entire United States in between. These rich neighborhoods have spawned a new cuisine, melding tradition with experimentation, and taking advantage of locally available ingredients and modern cooking methods. This book is a celebration of that cuisine: not the painstakingly authentic dishes of the homeland, or the hypercreative chef-y inventions of fusion cuisine, but the comforting, delicious food that’s enjoyed in home kitchens and mom-and-pop restaurants across the country, accessible to all cooks. The Latin-American population is the fastest growing in the United States--over 30 million people. Just look at the starting lineup of Major League Baseball if you need deeper proof. It's a population rich in cultural diversity, roots reaching back all over the place--Cuba, Puerto Rico, Mexico, Peru, Argentina. 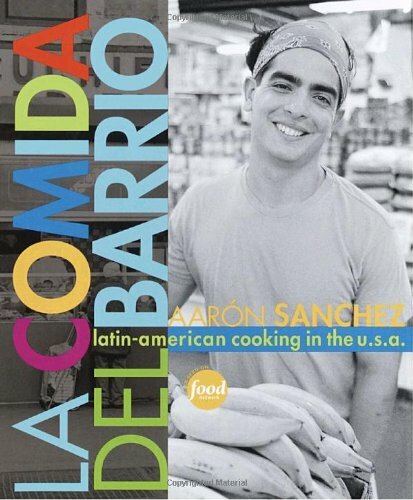 And the nice thing that happens in this country, as Aaron Sanchez so eloquently points out in his first cookbook, La Comida del Barrio, is that this multilayerd diversity melts all over itself and becomes something new while suggesting something old and stable. "This book is not about 'authentic' regional dishes," Sanchez writes in his introduction. Rather, it's about the real food of the real barrio, the Latin neighborhood, wherever that may be these days in the US. You'll find a small soup stand, la fonda, in the marketplace and that's his first chapter--black bean soup, shrimp chowder, plantain soup, menudo. Then there's the home kitchen restaurant, el paladar, open to the lucky ones who can find it. Stews are typical, and that's the next chapter--Brazilian cassoulet, roasted rabbit. The chapters march right up the Latin dining scale: la taquería for street snacks, la rosticcería for roasted meats, el comedor (the restaurant) for salads and entrees, el Mercado for vegetables and side dishes, la pandería for baked goods and sweets, la jugería for drinks, and a final chapter on essential recipes. Author Aaron Sanchez was at the South Beach Food and Wine festival last week and was FANTASTIC! He made recipes from the book and made traditional dishes like mole effortless. His personality and love of cooking and tradition clearly showed. 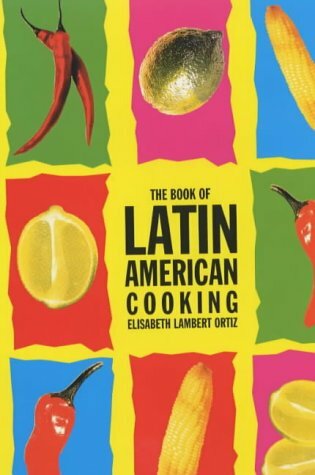 Because I am Latin American I found these recipes to be familiar.I was looking for a cookbook that had traditional meals and I found it in this book.Having my share of cookbooks, I actually found this book to be one of the easiest.As I write this review, I am marinating a Pork Shoulder with Oregano, Salt, Galic and Olive Oil.It really can't get much easier than that.But if you are looking for quick easy cooking during the week, this might not be the best cookbook for you. My one complaint about this book is that it does not have any pictures of the food itself.For those that have never eaten or seen these recipes cooked it can be pretty hard to imagine what it's suppose to look like. Also, being familiar with these recipes I know what to leave out and what substitues I can use. This is a great book for latinos learning to cook the foods their families made.This is not however a "traditional" cookbook for regional dishes. These recipes were as close to my mothers recipes and she's a great cook. If you want to make various dishes from Latin America, this is the book for you. Have owned this cookbook forlittle over a year..